Eggplants, aubergines or brinjals; call them what you will, but most of us are pretty much clueless as to what to do with this perfect purple delight. Along with an undeserved reputation for being bitter, eggplants are unjustly thought of as greasy. Typically shallow fried, eggplant’s absorbent flesh is easily saturated with excessive amounts of oil and can result in the dish becoming too rich. Luckily, however, there are a couple of ways to cook eggplants without the need to have your local cardiac surgeon on speed-dial, those being steaming and roasting. As the name of the recipe suggests this dish involves the latter method and the results are just to die for, as roasted eggplants and miso are quite simply a match made in heaven. Traditionally nasu dengaku is made with eggplants that have been cut in half and then grilled, but this method only really works with thin Japanese eggplants which are, unfortunately, quite hard to come by in Cape Town. 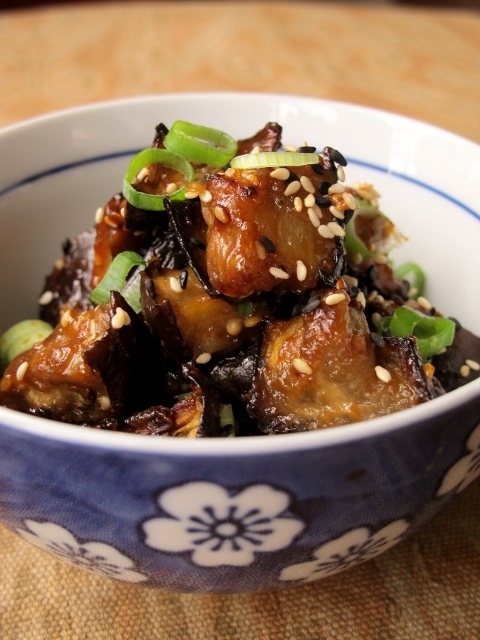 As such, you are welcome to oven-roast halved eggplants if you prefer, but it just seems so much easier to cube them instead, as the end result isn’t that dissimilar and makes for a more chopstick-friendly meal. This dish makes for a wonderful addition to any Japanese spread and is also great in salads or even sandwiches (nasu dengaku on a ham and cheese sandwich would be all kinds of awesome! ).